About — Huckleberry Letterpress Co. Originally started in Brooklyn, New York, Huckleberry Letterpress Co. recently relocated upstate to a small sleepy town in Dolgeville, New York. Huckleberry focuses on creating well-crafted, modern stationery and printed goods. Husband and wife team, Emily and Justin Reynolds first fell in love with letterpress while printing their wedding invitations at The Arm NYC. From their very first crank of a Vandercook Universal I, they were hooked. We believe in pairing distinct typography, design and illustration with the high quality technique of letterpress printing. We strive to create beautiful, funny and sarcastic cards and printed goods. All of our products are made by Huckleberry Letterpress Co. We handprint everything on an early 1900's Chandler and Price and a 1960's Heidelberg Windmill. All of our materials are made in the United States. No exceptions. We currently offer folded greeting cards and thick flat cards for resale. Are you a retailer? Please visit our wholesale section for more information. 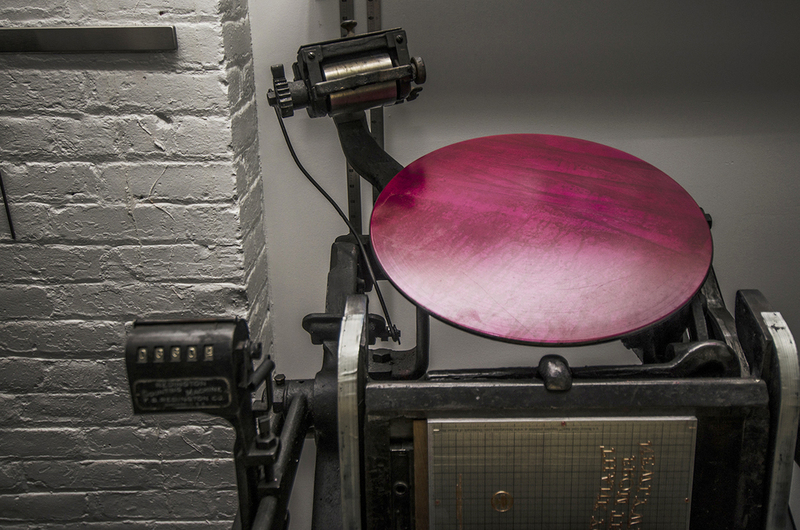 We offer custom letterpress printing for designers, businesses, and individuals. We love helping customers create a beautiful prints, whether it be for a wedding or small business. For more information on printing services, check out our custom letterpress section. Emily hails from Boston and came to New York to study print design at the Fashion Institute of Technology. She has worked as a textile and pattern designer with well-known brands such as JCrew and Coach. She is freakishly good at assembling Ikea furniture, which may be due to her Swedish roots. She enjoys spending time with her husband, Justin and her adorable daughter Harper. Justin grew up in the woodlands of upstate New York. After years of slogging behind a computer screen as a graphic designer, Justin is delighted to get his hands dirty pressing his designs into thick paper. He enjoys spending time with his beautiful wife, Emily and his adorable daughter Harper. We love collaborating with illustrators, hand-letterers and designers. We have regular contributors who create beautiful designs exclusively for Huckleberry Letterpress Co. Each contributor is selected by our team based on the artist’s style and quality.